It always surprises me how fast the New Year approaches us! Before you know it, 2019 will be taking over and a whole new year of brides-to-be will begin inching closer to the day they walk down the aisle. If you’re a bride planning a 2019 spring wedding, then this blog is for you! So, what should you be on the lookout for in terms of popular themes, color swatches, dress styles, and such? The wedding industry experts at PAPER & LACE are here to give you all the deets on spring 2019’s hottest wedding trends! 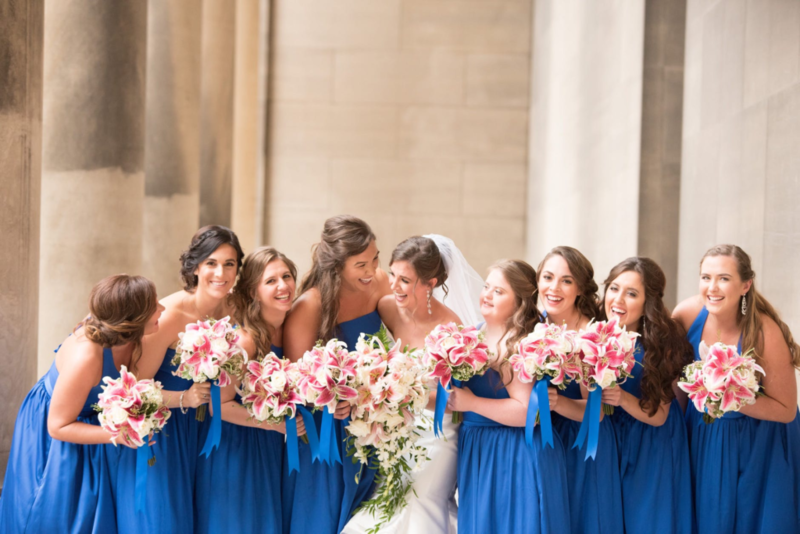 You’ll notice color has started to creep into a lot of modern weddings, and we just adore it. Inspired by Indian and Asian traditional attires, such as those found at Sonas Haute Couture, the western bridal dress has started to incorporate color and embroidery that just adds that little extra flair! While petit fleurs lined the wedding dresses of seasons past, designers are now opting to take a lusher approach to fabric florals this upcoming season. Rather than reaching for an oversized bouquet, why not take the idea of your wedding flowers center stage– from embroidered versions to plush appliqués. When styling this trend, keep the flora and fauna minimal elsewhere (AKA don’t pair the statement flower gown with that huge bouquet we mentioned – total overload). When it comes to wedding dress trends for spring 2019, metallics are also making a fierce statement. These edgier, bold colors are replacing traditional pastels for the bride looking to infuse a hint of color without donning bright hues. 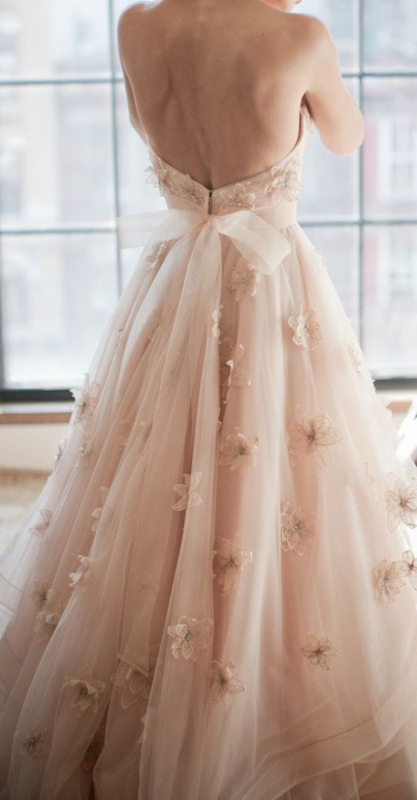 The inclusion of bow appliques on wedding dresses may not seem so shocking, but in this scale – we’re talking big bows! – it feels fresh and unexpected. While in the past trimmings and waistlines were adorned with this feminine touch, 2019 is calling for bolder add-ons–and for these fastenings to become focal points rather than finishings. Flowing, florally arches lining the aisle and altar are truly breathtaking! 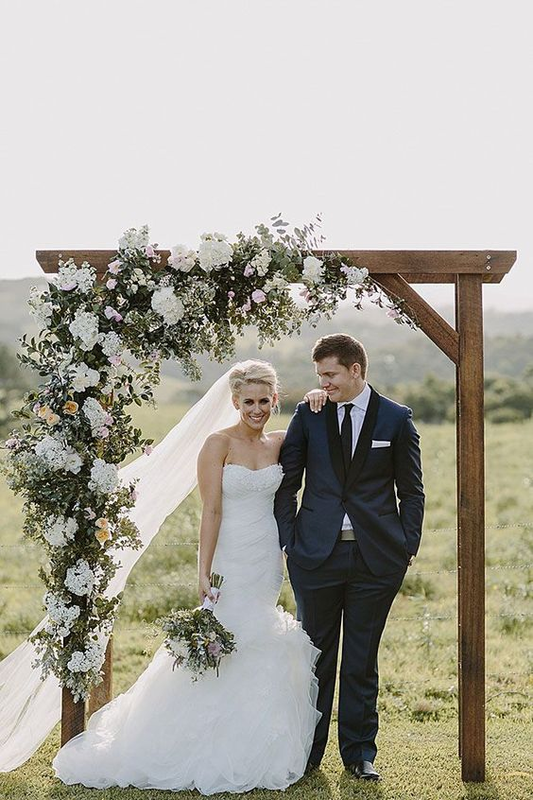 And because wedding arches symbolize the “gateway” to a new life that the newlyweds will live after tying the knot, an eye-catching arch is the perfect addition to your 2019 spring wedding décor. According to wedding experts, you can expect for next year’s weddings to be filled with décor hues as bright as the eye can see. Moving away from conventional whites and creams, reds, pinks and even oranges are set to take a starring role in everything from floral arrangements to bridesmaid dresses. Metallic wedding dresses (just like wedding dresses!!) are also on the horizon, meaning bold, brassy and literally golden gowns could soon be ‘the thing’. The use of chic, velvet fabrics in spring wedding décor will help create a warm, cozy, and homey atmosphere. 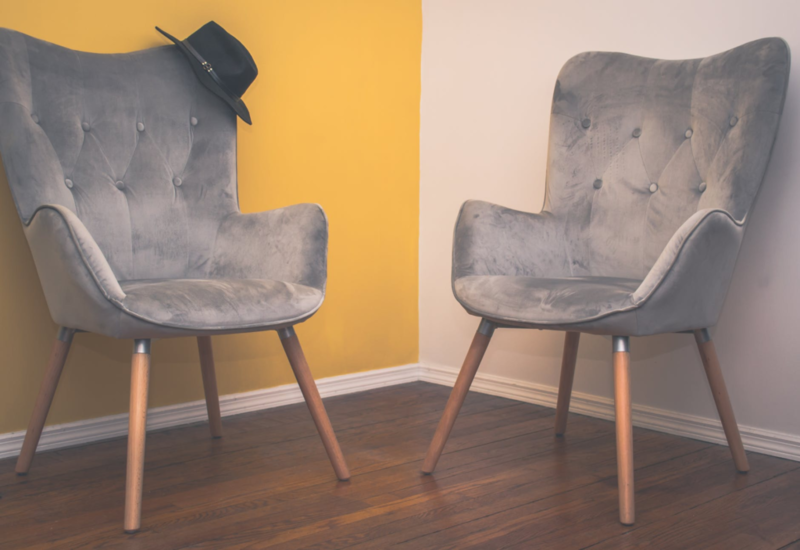 Fill your cocktail hour space with an array of mismatching (but probably color-matching), old-fashioned corduroy armchairs to keep guests feeling right at home. Tie the concept into the main reception area with luxurious velvet curtains and drapes. 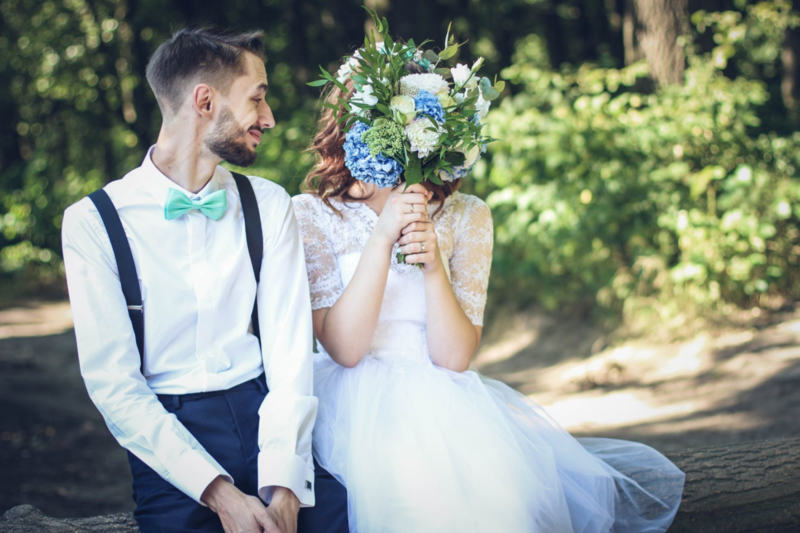 Sustainability is more than just a fashion trend – and, coming this spring more than ever before – the wedding industry is taking notice. When you head out to a wedding this spring, expect a rise in eco-friendly junctures, featuring flowers that can be replanted, organic menus, and minimal plastic, among similar moves. The surge of ‘green’ wedding ceremonies has been spearheaded by Princess Eugenie, who recently revealed that her impending nuptials to Jack Brooksbank will be entirely free from plastic. Couples are also being inspired by the philanthropy of The Meghan Markle and Prince Harry, who made a series of charitable donations when they celebrated their wedding in May as opposed to asking for gifts. 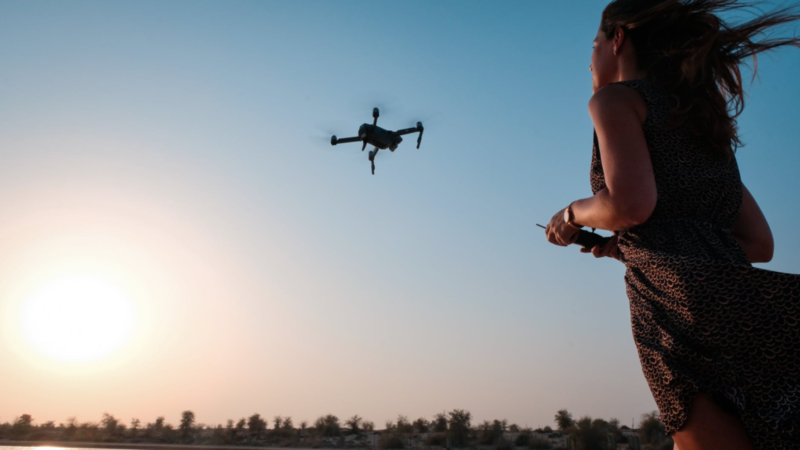 Video-mapping and drones may sound like something out of a Sci-Fi movie rather than a wedding, but new, techy touches are already infiltrating the matrimonial sphere, with some couples employing drones to take memorable snaps of their big day from a great height while using an array of other advanced technologies to capture the experience on video. 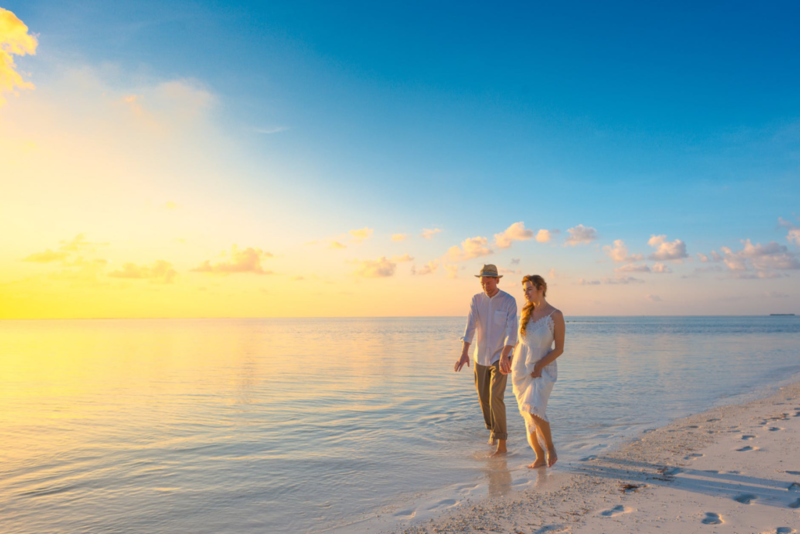 The married couples of tomorrow may shun traditional honeymoons and opt for engagement moons instead – choosing to take a relaxing vacation together before saying “I do” as opposed to afterwards. This is primarily because, as we all know, weddings are expensive and a person’s pockets may be feeling a little empty after splashing out on the day itself. Hence the desire to plan a trip sooner, when the piggy bank is still looking healthy. From wedding invites and menus to table plans and signage, the newest, coveted contemporary wedding stationery trend is acrylic wedding stationery. Maybe you’ve spotted them in the PAPER & LACE shop or totally blowing up on Pinterest. 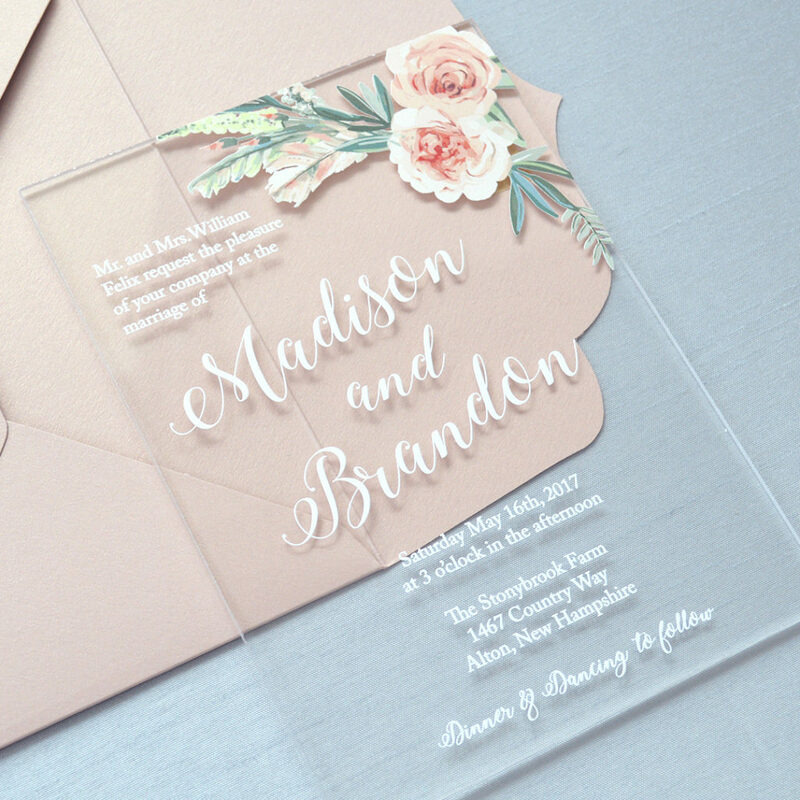 Acrylic wedding invites offer a very subtle look. This wedding stationery trend is minimal yet edgy, simple yet cool. It’s safe to say these are not your mother’s wedding invites and would definitely get people talking. Browse the acrylic wedding invite offerings on PAPER & LACE to learn more!